I wanted to provide another update on how my authority site project is going. This is a project that I started 6 or 7 months ago to try and build a large niche site, rather than the small niche sites that I typically build. You can catch up on the project from the very beginning right here. In a nutshell, I choose a keyword that received around 16k exact match searches per month and had a high CPC. It was a keyword that I knew would be difficult to rank for quickly, but felt like I could get onto the first page after 6 months to a year. Up to this point, I have only briefly touched the bottom of page 1 a couple of times on Google. For the most part I have been hanging out in the middle or bottom of page 2. In the month of February, I did very little to the site. As I discussed previously, I had created over 100 articles for this authority site. These posts have been scheduled to be published on the site over the past couple of months. So, even though I physically didn't do anything, the site was still posting new content up until around the middle of February. Now there are around 130 articles on the site. I don't plan on adding any new content for the time being. I'll reassess in a couple of months. Towards the end of the month, I switched my authority site over to using the Niche Website Theme! As you are probably aware, this is the new WordPress theme that Chris Guthrie and I officially released last week. I have personally been using the theme for a few weeks. Last time I checked, there are just 42 27 12 ZERO more copies left at the introductory price. So, if you want to pick it up, you can do so right here. We will be reopening the doors in a couple of weeks, get on the waiting list right here. I wanted to use this theme because it will allow me to test out different ad variations and help me increase the Google Adsense earnings. I haven't been satisfied with the Click Through Rate I have been getting, so this will give me a chance to test out a few variations. I plan to start adding some variations this week. I have to admit that I was a bit disappointed with the ranking for my authority site. This is the second month in a row that it actually dropped in rank. However, on the bright side is that the site did not drop in earnings. It stayed virtually the same, with a very slight increase. I can't explain why the site would have dropped in rank again. In fact, the site now has a PageRank of 2 which is pretty decent for a 7 month old site usually. Just goes to show you again that PageRank doesn't always tell you alot where a site should actually be ranking in Google. The fact, that my site dropped to position 24 in Google for its primary keyword, really doesn't tell the whole story anyway. As you noticed, my earnings actually increased slightly, despite the drop in rank. Well, there is a simple explanation for this. Most of the traffic to this site comes from long tail keywords – other than my primary keyword. In fact, I am lucky to get 1 or 2 visitors a day from my primary keyword via Google. So, this is why my site is still earning the same, the traffic is coming from other keywords. I have done a bit more link building via Unique Article Wizard, BuildMyRank, and MyArticleNetwork. Perhaps I have been building too many links again? Not really sure. So, this month, I think I will actually take a break from building links to the site and see what happens. I can always start a new linkbuilding campaign if I need to. Despite the drop in rank, and my hopes that the site would be performing better for now, it still is earning me a consistent amount each month. At $132 a month, I could technically probably sell the site for 15 times that amount at any time or about $2,000. If I hit the year mark on this site and still am unable to improve its rank, I may opt for selling it. Of course, that is still a bit premature. For now, I will enjoy the passive $130+ per month! I would be interested in hearing your thoughts and discussing any questions that you might have about my authority site. Please leave a comment or question below, and lets discuss! This is definitely an interesting experiment! If you don’t mind me asking, what percentage of your organic traffic is coming from your primary keyword? I would say its only 1 or 2 percent of the overall traffic. I get traffic from many other keywords. I would imagine you do with 130 articles on the site! No, I have not noticed an across the board drop in ranks. It is hard to knock an extra $130 a month. Even if your earnings plateau right where they are you can’t be that far from breaking even. After that, it is pure passive income and isn’t that what we all want? I agree! I’ll definitely take the $130 a month. ya but how much did you spend on marketing and articles, you’re in the hole on this project. Yes, everyone is aware of how much I’ve spent on the project…I’ve been very open in past articles. Its not a news breaker dude. If I sold the site today, I would be profitable dude. Are you still building links for this site? Are you going to do an update for the 20 sites started in August? I have been building links fairly consistently up until now. I am considering re-assessing how I’m going about building links as it does not appear to be increasing the rank at this point. I wasn’t planning on doing an update on the sites from August. However, they did indeed earn at least as much as I posted in my last update…so they are still doing well! Its great to hear that they are still earning well. 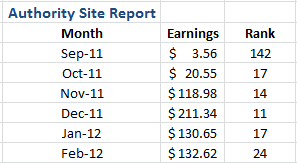 For me personally it is the greatest motivator to actually see earnings on your sites. I eagerly look forward to your earnings post every month. That is ultimately what we are all trying to achieve and when starting out and putting tons of work into a site it really helps to see some end results. Thanks for sharing!! Don’t forget, as is common right now, Google did some updating to it’s algo and that may have affected things a little bit. Apparently link diversity is more important than ever, although who know’s where the limits to this happen to be. Thanks for the thoughts! I think you are right, that I need to consider some more diversified link building and perhaps I will try some different things out. I think Fraser has a great business models for those that can keep up! Would you not want to build better quality links for an authority site than the ones you get via BMR and the other two networks you mentioned? Next post. Analyze anchor diversity to see if you are heavy on your Target keyword. Or you can update this post. Can’t just neglect latest panda can we? Bo, great idea…perhaps I’ll take an in depth look at this for next month. If you’ve read Spencer’s backlinking strategy, you’ll see that he isn’t weighted more than 33% at the maximum. Actually when I think about it, the percentage is probably way less than that. Interesting that it dropped in rank but still made a little more. My guess is that you are getting more clicks from other secondary keywords which would be good. I’ve got a friend who has pulled back on his BMR posts and after doing so, he jumped from page 2 to 1 on Google and has stayed there for the past 3+ weeks. Sorry to hear your sites rank is dropping. Maybe it was the unnatural link building that cause the issue. I have a question for you about MAN. I just got it. What is your distribution limit? I put mine at 50 so far. Should I do more or less? Also with putting 3 links into one article for different sites does this mean each site gets 9 links total? And do you ever link more deeply into a niche site besides the root domain? I don’t have a distribution limit, but very few (if any) articles actually get distributed to more than 40 or 50 sites. I have done lots of deep linking on this authority site. Okay – thanks Spencer. I’ll not set a distribution limit. Am I right in thinking we get 9 links for each niche site with the way you explained it in your video? Yes, it could be as many as 3 links per article. However, you can also link to 3 different sites per article, you don’t have to link to the same site with each link. If nothing else, you should at least deep link with 2 of the links. Yeah so what I am doing is linking to 3 different niche sites per article. Then I am doing 3 article submissions per niche site as you explained. So therefore I have 9 links in total I believe. Then I repeat this process for the other sites and change link #1 to Link #2 and Link #2 to Link #3 and Link #3 to Link #1. Hopefully I got this right. Thanks! Whilst this might pull the wrath of google bot down upoun my domains !! Im currently getting great ranking over multimonths using a single type of link building process (a blog type network but not one mentioned here)! I dont think a lack of link types is to fatal post panda but i would always advise diversity in type as well as anchor text. Are you varying the anchor text a lot Spencer. So exatc, Lots of different phrase and “cloud cover” stuff such as click here, mor einfo, www. etc? It can be very worth while looking at what the top ten are using/recieving in anchor text using MarketSamuri or similar tools. Its quite suprising how dicverse anchor text is on authority sites, where the text i created by users. Once process is to simply take all the variation from the top ten and use those in your own anchor text work. I’d also suggest that tons of new content and no links is not a good strategy. They should get some links at least? I do indeed vary anchor text, but could always do a better job. Spencer, how much have you spent in total on this site? Let’s know the breakdown and let’s calculate if its worth investing on. I’ve discussed this in depth in previous articles about the authority site. I think that as great as BMR is, the links drop off eventually. Why don’t you set up an anchor layer of web 2.0s and blast the the anchor layer with something like article marketing robot? I’m not convinced that BMR alone or UAW is enough to tackle a highly competitive keyword, they do a great job of getting you to page 1/top of page 2 but after a certain number they top out. I believe myself and others have seen BMR lose potency after 200 links. I assume that you are delivering the links to all pages and not just the home page? You are correct that I have been linking to most of the inner pages and not just the homepage. I’ve always avoided doing link wheels, etc as you suggest – but perhaps it times to dig in and try it out for this site. Thanks for the suggestion. I am not sure if you are aware that Google slapped the blog networks quite badly recently and devalued links from them. this might be the reason for your drop. It is always good to diversify you link building efforts in case this happens. a good linking strategy is very important. I would be happy to speak more about this if you (and your readers ) are interested. Yes, I have heard the rumors Sebastian on blog networks all getting links devalued. I’m not completely convinced though, as many of my sites still rank quite well using these links. I will share a few tricks not sure if anyone already has or not. Make sure you build a decent amount of links to your inner pages. Google gets suspicious of sites that have all links to the homepage. It just is not natural. If you like a post you link to the post on your blog not the website in general and tell people to look for it and this is what google expects. Make sure you put in random keywords you are not trying to link for like for example “visit my website” I try to hit around thirty percent this way i am not over optimizing. If all your links are KW related you do stand a chance of over optimizing and losing your rank. Diversity! You listed some good places to link build but there is no diversity on link types. This also look suspicious. Try social networking syndd does a great job of that. Also try standard blog commenting as well and at last but not least forum profile links .While some people do say these things will not get you ranked and I do agree. Alone they are not enough to get you ranked but you need diversity and together they will help you rank. For the love of god man do not stop building links this is an immediate red flag that something is not right. Keep doing what you are doing but mix it up with some of the tricks I just discussed. I have used the following methods and have ranked in some of the most competitive KW’s there is. It works just do not stop no matter what google does. Alright Christopher! You are keeping me motivated here. Time to add some diversity. I’m going to keep this interesting for next month…I’ll add some more links as you suggest! Awesome news Spencer. just remember I know some times you may get discouraged. I know I have. In one niche I went from page 5 to page 30 overnight. I felt like I wasted thousands of dollars and countless man hours for nothing. But you know what I did? I kept building links eventually my ranking did come back and jump up some slots. About 3 months later I hit the front page. My feeling is google tries to trick us. They try to catch us off guard. Every link counts as a vote to your site so to speak. If all of a sudden google tricks you and makes you think that ohh man I got to lay off link building those votes stop which tells google that maybe they where right for devaluing your site. Social indicators. Now I did speak on Syndd earlier. If your site appears to be doing well in the social networks google does take that into consideration when ranking your sites. Some friends of mine have used social indicators to rank there long tails with some varying degrees of success. It just works Spencer. Also not to mention the CRAZY traffic that is coming from social entworks now days. It is something you do not want to leave on the table. If you must i would even if you are not sure try going to a forum and buying social indicators off of providers. not as good as syndd but it is a way to get your feet wet. Excellent tips! and just to add anyone reading this dont do this in a day! Build up these different links over time adding a different amount a day as adding 1000+ links all at once is not good practice and may even get your site sandboxed or deindexed. I have an authority site as well. I’ve been steadily climbing in traffic and keyword rankings for several months now. Then suddenly in March (specifically on March 7th) my traffic and clicks (according to analytics and webmasters tools) drop by half. Previously I was averaging about 100 – 120 visitors per day on about 4500 impressions (SERP), and now for the last couple days, I’m averaging about 50 visitors on 2,000 impressions. Hopefully it’s just a typical Google dance, but I guess we’ll see. Thanks for the continuing blog updates! Sorry to hear it Chris. Best of luck getting that traffic back! Must be the month to get bumped down a couple of notches. Slid down a few notches for my main site myself. I’ve always felt it was ugly and rather thin, so I think I’ll focus on beefing mine up before I try links again. I feel your pain Spencer. I have a couple of mini sites that are on the first page of Yahoo and Bing but cannot even be found on Google. I don’t even know how to begin understanding that one. But I guess with Google’s updates this is the new reality. We had the same issue in the past with rankings of #1 and #2 with bing/yahoo but not in the top 500 with Google. I discussed this with one of my internet masters and his thoughts were that we had been blacklisted by Google for some reason. Probably associated with some duplicate content or even backlinks to sites that had been blacklisted. Even if you change out your links/content, the spiders will still recognize the site as blacklisted from previous searches. His recommendation was to Change out the subdomain and H1’s to a different longtail and put in some fresh content. Bottom line if you have a site that has been published for quite a while and still MIA on google you have nothing to lose. I followed his recommendations and have since started moving up on the rankings with google and maintained a page 1-2 ranking with Bing/Yahoo. I find it hard to believe a site on page 2 of the search results has earned over $100 monthly for the past 4 months. It’s hard enough earning $100 monthly when you’re in the top 3 let alone page 2. I imagine he is making that kind of money based on the fact that he has 130 articles and they are probably ranking on page one for different long tail keywords. Spencer is just showing what his SE rank is based on his “primary” keyword. And if those long tail keywords get a lot of searches, then he’s going to get a lot of traffic. I am not ranking well for my primary keyword, BUT of course I am ranking on page one for LOTS of other long tail keywords. These keywords might only bring in 1 or 2 visitors a day, but with hundreds of them, it all adds up. Hope that helps. What kind of advice can you give newbies for linkbuilding that can’t afford all three of the services you’ve provided? I might try solely UAW for now. Is one service enough to get going? I’m sure diversifying your links helps in terms of volume and appearing to use different networks. You can always go over to Fiverr and hire someone to do a linkbuilding job for you using one of the networks, then you don’t have to invest in a monthly service. I experienced the same with one of my sites has over 146 posts and 1.5 yrs old. The revenue dropped about $175 for Feb.About 50% less visitors according to my Google analytics. Must be the recent panda update shifting the rankings abit but I’m confident my traffic and adsense revenue will return in April for this site. See how it all pans out. Let us know how you go for March and April for this authority site Spencer. Sorry to hear it. I will definitely keep everyone updated! A lot of sites that use BMR took a dip. I have built a number of authority sites over the last year. Are you using Pages or Posts? I have found that my sites with Pages tend to do much better. In fact, I won’t even mess with posts anymore. Also, for authority sites you need more diversity. Articles directories, blog networks, directory submissions, press releases, social book marks, blog comments, maybe even a link wheel or high pr contextual links. My 2 cents… Looking forward to more updates! Interesting comment about pages versus posts… I think I’ll try all pages on my next site. But out of my ranking sites I have seen no negative impact since the Panda 3.3 update. In fact I’ve had several pages increase in rankings recently. I’ve done no additional back linking for these sites in months. With all that being said I only have 6 sites that are on page 1 of Google, and about 25 on page two. And I’m still only making less than $200 per month. So I’m not sure how valid my observations are. Jason, great advice. After reading the comments hear, I’ve decided to do just as you recommend. Building some links with more diversity outside of blog networks. I have been deep linking already and will continue to do so. I just read somewhere that it’s best to use pages instead of posts because pages won’t be “diluted.” I just heard about this so I need to find out WHY pages are better for ranking KWs and IF this is true. Also, I am having a hard time wrapping my head around a WP site built entirely on pages instead of posts. Does anyone have any good information about WordPress pages vs. posts for ranking keywords? Spencer/all – what are your thoughts about this? I don’t know that it makes a difference. I have sites that use “Pages” and I have sites that use “Posts”. I have sites from both categories ranking well. When you will get to your primary keyowrd, you will get much more money.. 130 is nothing, really for 100+ pages the goal is much higher.. 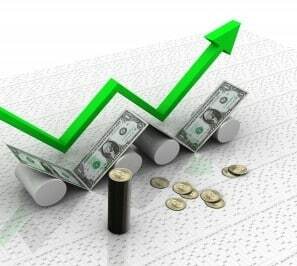 I think that after another invesment of 1000-500$ you can easily triple++ your income.. Thanks Spencer! As usual great information. Question and then a comment. What ad placement position are you earning the majority of your adsense over the past couple of months? Regarding the google changes. We have noticed that over the past several months google seems to be hitting blogs hard and providing ranking improvement to information/news sites. We have noticed that our blog sites have been hit (like others have reported), but our information/news style sites that we are putting together with our new system have been ranking very well. In fact, we have been able to get them on page 1-2 in less than a month on the longtails…some within a couple of weeks. We aren’t even close to the top pages with the blog style that we have been putting out during the same time. Bottom line, IMO, Google is really changing their spider search algorithms to penalize sites that aren’t informational/news worthy….Thoughts? Randy, how do you define a “news/informational” site compared to a “blog site” – in my view these are essentially the same. In fact there are many WordPress blog “News themes”. Also, the huge majority of my adsense earnings come from either a 336×280 or 300×250 ad unit just under the title either right or left justified with the content wrapping. Many “blog” sites have limited true information and are styled like an infomercial….Their content also seems to be spread away from the targeted keyword. What seems to be happening, is the spiders are going deeper into content now and unless it is VERY target keyword specific they get de-ranked quickly. Informational or news style, have a consistent changing of the content YET all of it is very consistent with the targeted keyword and has reader value… Example of a good informational/newsite would be what you had as your example in your recent video that had the keyword medical assistant salary. Okay, makes sense. Great tips Randy! Since panda has been updated to 3.3 I’ve noticed that BMR has been less effective. It’s still helping me climb up the search results but much slower than it used to. I’m starting a few smaller niche sites, I hope BMR will still be effective on them! I hope you figure out how to get your site to start climbing the ranks again! Spencer, I know you have a lot of content investment on your niche site project. May I know how much you have paid on the content so far? For building an authority site, it would take about 6 mos to a year to let Google give you the love. I’d suggest you to interlink each content and keep the bounce-rate low. Most of Authority Sites, end-users stay long rather than read and click away. Also for your money-making micro niche sites, doesn’t hurt to add a fresh content on weekly basis. They become your “Authority Sites” and sure that you will see better traffic growth and ROI as this authority site project. Thanks for sharing your trial and experiment. Great inspiration! I hesitant to build Adsense Authority Site due to my thin start-up cost for now. Still love your LongTail Niche Site approach though. Thanks for the great comment Kent! congratulations on slow and steady success. curious about your valuation methods. have you bought/sold sites in the past? if so, do you always value sites are a multiple of month earnings? seems low? Yes, I have sold a few sites in the past. About 15 times monthly earnings is fairly standard for smaller sites. In fact if you look at sales on Flippa, many sites will go for less than 15 times monthly earnings. Larger sites that have aged quite a bit can start commanding 3 or more times ANNUAL earnings. getting very frustrated with Google. I have had several sites that were off to a good start, excellent rankings, and actually starting to make money. Then in early March ..bango…almost all of my sites fell off the map. I am really questioning the wisdom of trying to build a business around google. I am now looking at them more as the evil empire. They are the greedy pigs reaping all the benefit, dumping on the little guys..constantly. Time for a new model that is not dependent on the whims of rich ol google. I probably had movement in the search engines for OTHER keywords besides my primary keyword as well. Great update Spencer! I’m sure you have made your money back from it and opting to sell it wouldn’t be a bad idea. Have you considered doing any guest post’s and building some nice authority from the back links? Not sure if it’s in a niche suitable for guest posting or not, but those types of back links are some really valuable links. I hadn’t planned on doing any guest posts. But that is certainly a good option here to get some valuable links. I recently went through the same thing with a few of my sites and leaving them alone for one month really paid off. With 130 articles on your site I am sure that your income will increase this month and hopefully your main keyword position. Good luck and can’t wait for the next months update. Spenser you mentioned you have several smaller niche sites in the same niche. I suppose those are older sites and some may be high PR, may be you can use your niche sites to link to your Authority site. Those would be natural links, or is this something you already did? I have not done this Abhi, but I’ve certainly considered it. I have been Panda crushed this March. I suppose it was my own fault for too much link building on my web site which is 16 years old and has several hundred deep pages. I have been up and down the yo yo string many times before, but never sand boxed. I will have to check on that. I had very competitive keyword phrases that I had worked up to second page positions and one to position 5. Google gave me an unwelcome birthday present on March 6 and my keywords went from page two to page 13, 5, 10, 500+, 16, 14. Too much promotion of keywords to my main page, I guess. My deep pages did not suffer very much if at all. I have switched all my promotional linking to 100% deep links. Sorry to hear that David. Google did of course and is constantly rolling out algorithm changes, so that is likely part of the issue. lol. Happy B-day – glad you got the Roomba! do you have an actual demo of your theme and not the one in the video? looks great..can you upload a full header on it – one with photos and text…i did not see it being mentioned in the video? It seems too much attention is still being given to the mechanics of site development and backlinking, etc. Onsite user metrics that Google is getting better at measuring is telling them if the site is worth ranking well or not. Besides the brand bias Google has now after Panda, any site now has to have that “stickyness” factor. Great analysis Rob. Providing great and engaging content is definitely important. Any suggestions as what to do? No, I’m not avoiding it at all. I’ve been referring readers to previous articles on my authority site, I’ve given detailed breakdowns of how much the site cost previously. You can find all the information. Although its not hard to figure. The biggest expense was articles. At about $10 per article x 100. You get $1300. Then I have VA cost etc. Less than $2k though. Its not profitable yet, but if I sold it right now, I would be in the positive. Anyway, I plan on holding it to grow the revenue. From my own perspective I feel that a site that only 7 months old is still brand new in Google’s eyes. I watched my own little that is three years old now attain page 1 rankings (on pages ranked by Traffic Travis as very competitive) by adding about 3 or 4 backlinks every day along with a few press releases from time to time. I am still too new to using WordPress to comment on the page vs post question but I have researched the issue and pages to me make a lot more sense for the main substance with posts as supporting content. Anyway, I just wanted to express my thoughts and thank you for your site and your willingness to share your experiences. Thanks for your insights Barry about BMR and everything else! I am just thinking .. wouldn’t it be wiser to actually build fewer niche websites but actually pick 5 or 10 (instead of 100 for ex) a year that one intends to keep in the long run and really build informational websites that really have the look and feel of informational websites, with several pages inside etc.. These could be websites that could receive between 6000 and 15 000 exact match searches per month, while working simultaneously on long tails keywords on deep pages to rank well with other less competitive KW. I have a feeling that these would be less exposed to drops in rankings over time and other potential google-related risks than with 1-5 pages niche websites with lots of backlinks pointing to the same and only 1-5 pages (or even 10). I know it’s very tempting to diversify one’s income from various sources but it seems to me – and I have experienced in the past – that when the website truly brings value to the reader (and just a few pages won’t do it), you don’t have to fight so hard to keep your ranking. Keep adding content, content and content and see how it goes. In short, rather building backlinks around a website than building wesbites around backlinks. Love reading your posts by the way. Been learning lots over the past weeks. Perhaps, but I’ve done very well over the past few years with my business model. This authority site is a diversion from my typical sites; much bigger and much more effort put into it. So, I’m essentially doing what you say with this one site. I just choose to build some large sites and lots of little sites. So, I’m kinda doing both. you mentioned that your site had 100 articles and yet you don’t physically do anything you are still getting posts. do you have an auto plug in to generate your content or something. Also what ranking do your secondary or semantic keywords get. obviously this is where your main income is coming from. No. The content is all 100% original that I hired writers to write. I simply posted all the articles to be published at a future date. You can specify in WordPress at what time and day you want each article to go live. So, I posted them all to go live at specified time intervals over the past couple of months. Setting up your posts to apply every few days was a very smart idea. Most forget that is a built in option in WordPress. You can create your articles and then set them to post when ever you like. $130 isn’t to be sniffed at and I’m sure as other pages start ranking this will increase a lot. Have you been link building directly to the new pages or just to the home page? I have been linking to some of the new pages, but not all. I have quite a few deep links. Just my opinion: would you consider replacing UAW or MAN with other networks like Article Ranks and Authority Link Network? The latter two seems to get more praise recently! Hope your site’s ranking and earnings can go up next month! Yes, I would definitely consider replacing UAW and MAN with something else. I have changed what tools I use to build links many times over the past few years, so I very well may change the tools I use again very soon. Its part of the business: change. Hi Spenser – Do you know of any good alternatives to BMR, UAW etc? In Feb/March, Big G supposedly started “heavily de-indexing” private blog networks like BMR. I came across the post below and I think I’ll stay clear of the private networks for now! Do you think maybe this might be one of the reasons for your drop in ranking this month? Kara – This is a MAJOR deal…yes, I do think that this massive de-indexing had something to do with my drop in ranking. I am going to be writing a post soon about some of these changes in the industry. This is a HUGE deal, only more of a reason to use multiple networks! Thanks for sharing new services. At least I will consider changing UAW to something else because of two reasons: 1) I have got better results with MAN than UAW and 2) UAW is horrible inside. MAN is so much easier to use and what’s best: it’s a lot quicker. I’ll definitely check out Article Ranks and Authority Link Network. G has managed to deindex 22% of that network and are working on the rest. They seem to be targeting blog networks at present. Thanks for sharing this Rose! I think its time to rethink how we are using blog networks in the future. I’ll be writing about this soon. Cheap comments. You can get 25 PR1+ for $5…..not a bad deal to diversify things a bit. Also socialadr.com is a great, cheap/free source to get social bookmarks. I’ve been using traffic kaboom and link authority with good success too. I’m building Authority site with UV of about 100-150 daily. However my earnings varies from $20-$40 per month. I have around 100 posts as well. So how many UV are you getting daily to earn $130? I am also getting around 100 to 150 uniques a day. Perhaps I’m just in a higher paying niche. Spencer, thanks for these updates. Hope you will continue these. Do not give up on your authority site. I am focusing on my second authority site at the moment. The first one is a 3k per month adsense site. The second one, i believe, is a 5k dollar site. I have already spent about 6k on building it. Super quality content, custom design and logo. I was disappointed to see the site receiving 4000 visits per month and get 100 dollars in adsense rev per month. But i have chosen to go on and do seo for the site. Currently, the only seo done is directory sub. Spencer, there actually is no strategy 🙂 I just submitted to about 500 free directories first over a period of 3 months. And then i submitted to all the top paid directories. I had to shell out about 1500 dollars for that. But since i believe there is a ton revenue potential for the niche, i am hoping it would turn out for the best at the end. And these submissions have helped. Maybe not revenue wise. But the traffic is close to 4000 visits every month – all through very long tail phrases. And the only seo done is directory submission. This is only Adsense earnings? The toughest thing I’ve found is backlinking. The $5.00 for 10,000 backlinks never work 😉 and working FT and trying to build backlinks is quite a bit of work … though I understand that nothing is easy. i have been doing niche website for adsense too.. but i never bother monitoring or tracking its progress.. i just check stats, check earnings and go on.. I enjoyed reading your report of one blog you develop. Apparently, not only I feel rank up and down to the new blog. I could learn so much on how to be patient and continue to pursue appropriate strategies to improve blog ranking. Thank you very much. Sorry to ask a question that is probably answered in a previous post, but I’m wondering how the site is monetized. Are the earnings you are reporting strictly ad networks, or are you doing affiliate marketing or something else? This was all from Google Adsense. What are the best link building comapny you use? Nice open earnings disclosure, Spencer. This article adds balance to all the inflated(bogus) Monthly earnings posts on other websites out there…..
Also, it’s good to see you describe how you set out with a six month time frame, to achieve your ranking goal…. Are you still working on this Spencer? How’s it going now 12 months on? Am currently just about to start my first authority site in the financial and investing niche and this post has really been of great help. will be using guest posting and also some of the strategies that i have learnt from this comment section to help boost my ranking of the site.